Today I'll be talking about the beauty products that I used up in May and if I would repurchase them or not. Up & Up is the generic Target brand and this is a good nail polish remover because it's just acetone. It doesn't take too much rubbing to get the polish off. I've already repurchased. This is a nice smelling lotion that screams summer. I would repurchase if there was a good sale. These were just ok. I used them on my trip to wipe away most of my makeup and then used a real face cleanser after that. I wouldn't repurchase because there's a million other brands of makeup removers I'd like to try. I used this on my trip. It was fine. I'd repurchase if I could get it super cheap on sale and with coupons. This is the only deodorant I use. I have a million unopened in my bathroom. This was a good exfoliator but not as good as my beloved derma-e scrub. I wouldn't repurchase. I loved this mascara. It separated my lashes and made them dark and curly. It's a great daytime mascara. I wouldn't repurchase because although I liked it, there are comparable drugstore mascaras that give me the same effects and cost less. This was a good eye cream. I've gone through so many Estee Lauder eye cream minis through the years because I usually get them in free gifts with purchases. I would not repurchase because this is pricey and all it did was moisturize my eyes, I noticed no other effects. This sample lasted me several months! It made my dry skin so soft. I would not repurchase a full size because it's expensive and I didn't notice any real skin improvements. I may buy another mini but not anytime soon. 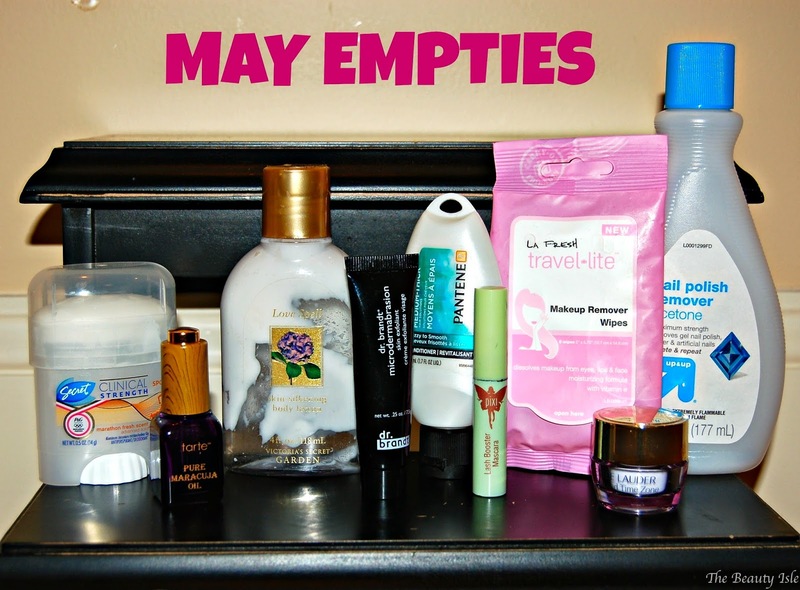 I hope you enjoyed this empties post. What beauty products have you used up and loved lately?